I’m writing to you because you may want to take part in our “Intercultural Dialogue through Community Media” initiative beginning this May. 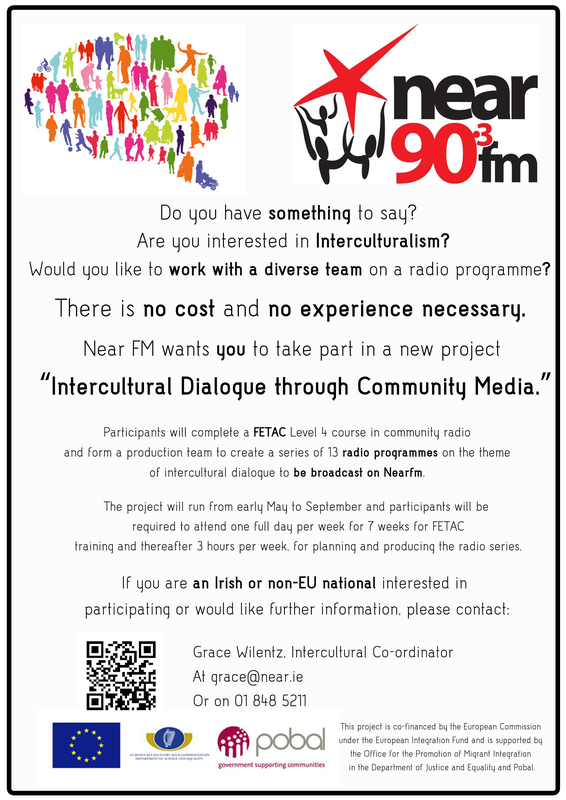 Nearfm are currently looking to get together a vibrant team of Irish and non-EU nationals to take part in our intercultural project. There is no cost. And no experience is necessary. Are you interested in interculturalism? Would you like to work with a diverse team on a radio programme? The project is in two parts. Part one is a 7 week FETAC level 4 course in Community Radio. Part two will see the team work together on 13 radio programmes on the theme of intercultural dialogue. Download the Motivation Form if you’re interested in participating in the project. Please return it by April 23rd to Grace (details below) if you are interested in applying to take part. Is it time to switch off Facebook? What can the disabled workforce bring to your company? ECT – What is the legal position? Electroconvulsive Therapy (ECT) is a method used to treat forms of mental illness. It can be very effective, but can also have negative side effects. Expert speakers discuss Electroconvulsive Therapy, if it works and if patients should have a choice in refusing to use it. The event is hosted by Labour Equality and chaired by Bernard Cantillon Chair Labour Equality. Wheelchair accessible. Everyone welcome! More information and to RSVP Kirsi Hanifin 087-6258043 kirsi.hanifin@labour.ie .